5793 labyrinths found. Showing 4001-4020. Sorted by country, state, city, then zip/postal code. Highland Avenue is right off Route 130 in Westville. A memorial for the victims of September 11, 2001, from this parish and the area. Designing and managing the construction of this labyrinth to benefit his township's public library was the Eagle Scout project of Matthew Salisbury of Wyckoff, New Jersey. Labyrinth is available for use during daylight hours in clear weather. Located in Central New Jersey, Hamilton Township, Mercer County, at border of Allentown, Monmouth County, near Trenton off of interchange Route I 195 & I 295 & also exit 7A of NJ Turnpike. Parking available - entrance to labyrinth across from Church through wall opening of memorial garden. This labyrinth is located on the Purple Adobe Lavender Farm in Abiquiu New Mexico. Abiquiu is located north west of Santa Fe in New Mexico on Hwy 84. It is very easy to find. It is located between mile marker 210 and 211. Their are purple flags on the road to mark the turn to the farm and labyrinth during open season. The farm is open April 1 to Oct 31 Tuesday through Saturday from 10 am till 5 pm. The labyrinth is open during open farm hours. Open Tuesday through Saturday 10 am till 5 pm. One family takes the opportunity to "fly" the CAPPED Labyrinth. Beautiful 25 foot labyrinth stenciled onto the conference room carpeting. The CAPPED Building is climate controlled. CAPPED Volunteers will lower the lights, play soothing music and you can enjoy the walk in total comfort. CAPPED, Inc. is a grassroots cancer prevention and support center and we are opened the CAPPED Center for Integrative Health Care in June 2013. All are welcome here! Labyrinth is available most weekdays from 11 am to 5 pm. It is however located in our community conference room, so please phone ahead to avoid the possibility of a time conflict. We are located in downtown Albuquerque at 4th and Silver Ave. SW. Our parking lot is at the corner of 3rd and Silver. Our hours are typically 9am to 4.30 pm Monday - Friday. We are often open for evening events, groups and concerts. We are also open Sunday mornings from 7.30 till after Noon. We suggest visiting our website and looking at the calendar to learn more about when we might be open. 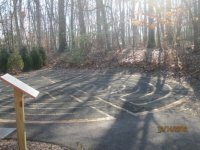 The labyrinth is in our protected garden that is the center of our Cathedral property. It is available for walking anytime the Cathedral is open for worship or business. All who seek to walk are welcome. Take the Avenida Cesar Chavez exit off of I-25 and turn west onto Avenida Cesar Chavez. Cesar Chavez becomes Bridge as it crosses the Rio Grande River. Continue on Bridge to the intersection of Bridge, Sunset, and Five Points (a three-way intersection). Sunset is the hard right, Five Points is the "soft" right (about 45 degrees). Turn right onto Five Points and continue to the Center for Action and Contemplation on the right. Weekday hours: 9:00 am to 12 noon and 1:00 to 4:00 pm (Mountain Time). Monday-Friday 8:30 am - 5:00 pm. Please check in at Spirituality Center office. Solomon Schechter Day School is part of the Jewish Community Center (JCC). The labyrinth is on the south side of the campus, in front of the schools entrance. 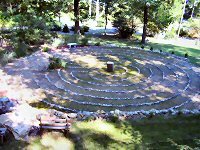 The labyrinth is on school grounds and open by appointment during the week 8:00 a.m-4:30 p.m. School groups welcome. Open to the public weekends, anytime. 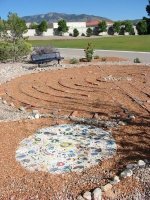 This labyrinth was built by teachers, parents, grandparents, friends, children, and other community members, for children to use. It is a small labyrinth with a meditation garden. There is a bench for parents to sit on while watching over children walking, or playing, in the labyrinth. About 1/2 mile north of Spain on Eubank. Albuquerque Labyrinth Society including New Life Presbyterian church volunteers and youth group from Covenant Presbyterian Church in College, Station, Texas. 35.143 N° Lat. ; 106.531 W° Long. About 1/2 mile north of Spain on Eubank. We also have an outdoor rock labyrinth for anytime public dawn-to-dusk walking. We have a Taizé service and labyrinth walk on the last Sunday of each month beginning at 6:30 PM. 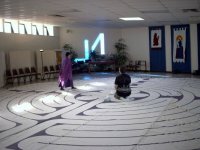 To learn more information about the Taize services and Labyrinth walks, go to www.newlifepcusa.org - the canvas labyrinth is also available for rental.